In only 10 minutes you can improve blood circulation in your legs by doing these five exercises. Consider doing them several times a day, making sure to rest in between. 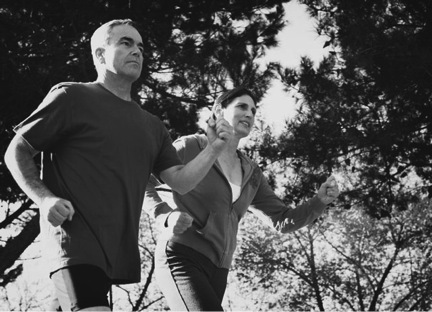 Walk briskly for 10 minutes, making sure to take long strides to stretch and extend the leg muscles. If you sit most of the day at work, consider taking the stairs instead of the elevator or walking a few laps around the halls. Lie flat on your back and raise both of your legs straight up. Hold them in place for two minutes; and then slowly lower them back to the floor. Rest for a few seconds and then repeat the leg lifts for two more minutes. Continue until you have completed five two-minute sets. Sit on the edge of a table or bench that is high enough for your legs to dangle but not touch the floor. Make circular motions with both legs going in the same direction for two minutes. Rest a few seconds and then reverse direction for two more minutes. Continue until you have done five two-minute circular leg exercises, and then lie flat on your back once more to rest. While sitting, bend and flex your foot and ankles with your toes stretched out and pointed upwards to work leg muscles and improve blood circulation. Do several repetitions of this for 10 minutes. This exercise is especially effective when done throughout the day while sitting in an office chair, on a couch or on the side of a bed. Sit on the side of a pool with only your legs in the water. Briskly, move your legs back and forth and up and down in the water for two minutes at a time with a few seconds rest in between. Do five two-minute sets and then remove your legs from the water. Stand and walk around a bit. Repeat the exercise as desired. With nearly one in four people in this country experiencing some form of leg vein disorder during their lifetimes varicose and spider veins a common occurrence, the frequency and symptoms of which are often exacerbated from working in professions that require prolonged standing or sitting for hours at a time. Not only are varicose veins unsightly, but they can also be very painful. That tired achy feeling can sap energy and keep you from going out and getting exercise. And while are genes dictate our predisposition to varicose veins the following simple exercises can help minimize the development of new varicose veins and alleviate pain from existing ones. The simplest exercise is to walk more. Get your legs moving. 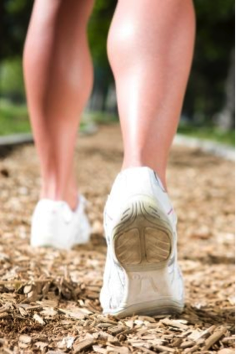 Walking is a great way to encourage blood circulation in your legs. Instead of taking the elevator or escalator use the stairs. Even going for a short walk around the block before going to work is enough to vastly improve symptoms. Begin lying on the floor, flat on your back. Place your hands out to your sides, if you prefer you can place them beneath your buttocks to prevent strain to the lower back. Lift your legs off the floor, and pedal them as if you were pedaling a bicycle. The more you elevate your legs, the more you will increase blood circulation. Reversely keeping your legs lower will increase resistance on your abdominals, toning your stomach. Continue this exercise until you feel the blood circulating through your legs and any existing pain has begun to abate. Unlike leg lifts performed at the gym, which are usually designed to tone your inner or outer thighs, these leg lifts are designed to help ameliorate blood flow through the entire leg. Lie on your back, placing your hands beneath your buttocks to eliminate lower back strain. Keeping your buttocks pressed down, and your lower back against the floor, lift one leg at a time and hold in an elevated pose perpendicular to the floor. Hold this pose until you feel the blood begin to flow back up from your feet, your calves, and your thighs. Repeat the motion with your other leg. For ultimate relaxation, lie on the floor with your buttocks almost touching a wall. Rest both your legs in an elevated pose resting against the wall, and feel the circulation in your legs improve. Alternately, you can raise both legs and rotate your ankles to further improve leg circulation. Lie again on the floor on your back. Slowly pull one knee into your chest, holding onto your leg behind your knee (holding on top of the kneecap puts undue pressure on this delicate joint). While your leg is in this position, point and flex your foot several times. Do this slowly and forcefully – don’t let your flap foot around loosely, but rather tighten the muscles of the calves and the tendons around your ankle. Repeat with the opposite leg. When you hear, “exercising will help prevent varicose veins,” you may think to yourself, “sure… but what kind?” We have the answer for you! These simple exercises can be done at home and will drastically help prevent varicose veins from developing! These are best done on a padded surface like your bed or a yoga mat. Lie on your back and raise both legs into the air, then begin to kick your feet in a circular motion as if pedaling a bicycle in midair. Begin by lying on a comfortably padded surface. Bring your right leg up to your chest and hold it behind the knee. Point your toes into the air, flex your foot and rotate your ankle, then bring your right leg down and repeat on the left side. Find a set of stairs; begin by standing on the bottom step with your heels dangling over the edge. Slowly push yourself up to your toes, holding a handrail for support if needed, then come back down gradually until your heels fall beneath the step again. These are all easy exercises that can be incorporated into your daily routine, and you can do as many reps of each as you please. These will not only help improve your vein strength, they will also improve your legs and core, and who doesn’t love a workout that does more than one thing? Enjoy! The U.S. Census expects by 2015 there will be 87 million people age 55 and older. Since vascular disease primarily affects seniors, the number of vascular disease cases is expected to rise dramatically. The vascular system is made up of arteries and veins that carry oxygen-rich blood throughout the body to organs, legs and the brain. As we age, the arteries and veins thicken with a buildup of plaque and cholesterol and get narrower. This restricts blood flow and can lead to dangerous vascular diseases that can cause strokes, ulcers and aneurysms. Here are some practices that will have a positive impact on vascular health and keep baby boomers healthy and active for many years to come. Up in Smoke- Stop smoking to lower your risk of having a stroke, heart attack or developing coronary heart disease. Diet Right- Eating a healthy, low fat diet will keep weight from creeping on, give you more energy, prevent diseases, help you sleep better and help you age more gracefully. Under Pressure- Take care of your blood pressure to keep it in a normal range. Get Movin’- Exercise regularly. Even walking daily can improve your mood, combat chronic diseases, and help you manage a healthy weight. People 55 and older should talk to their doctors about their vascular health. Vascular disease can be controlled if diagnosed and treated early. Vascular surgeons treat these diseases with minimally invasive procedures that are quick, relatively painless and receive great results! For more information about vascular health or the Reno Vein Clinic, please visit our website www.renoveinclinic.com or call us at (775) 329-3100.